During the wet season, some events and activities are cancelled or postponed due to rain, like baseball games, barbecues and picnics, open-air concerts. I’m sure everyone is all too familiar with the disappointment. When events and activities are not rained out, they are “rain-or-shine” events. Let’s say, you are planning to participate in an outdoor yoga class. The brochure says “All ages and levels are welcomed. Rain or shine.” It means anyone can join the event and it’ll be held whether it rains or the sun shines. The phrase is also used figuratively for “regardless of circumstances.” For example, when you say to your friend, “I’ll see you on Thursday, rain or shine,” it means you’ll see that friend on Thursday no matter what happens. Now, I’ll give you a quiz today. Please listen carefully and choose the one that is TRUE. Ready? 1. it will be called off when it rains. 2. it will happen whatever the weather. 3. it’s subject to weather conditions. 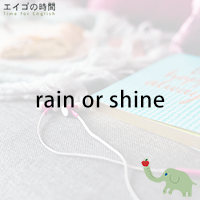 Next Post 降れば土砂降り – When it rains, it pours.